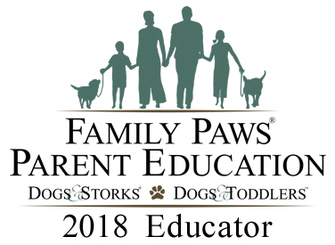 Family Paws Parent Education Programs in Winchester, Ma. families of babies 3 months to 3 years. The program sets the groundwork for successful dog and baby interactions by giving parents the important information they need to create a safe environment for and harmony among toddlers and dogs. Deborah Maida of Winchester Ma., is a licensed presenter of The Dog and Baby Connection and the owner of No Dog Too Small...Dog Walking and Pet Sitting is pleased to announce the Winchester kickoff of the Dog and Baby Connection. The Dog And Baby classes offers solutions to common issues that are positive , practical and both dog and baby friendly. These ideas will help increase baby safety, dog success and fun for the whole family. Deborah is offering both local group classes/ presentations and/or private consults for those needing a more detailed evaluation of their dog and instructional plan. The innovative program increases safety and success for dog and baby while decreasing stress and concerns for parents. What does the fantastic program cover? -The common but often overlooked "impulsive re-homing phase." Please contact Deborah Maida, owner of No Dog Too Small...Dog Walking and Pet Sitting LLC., at (781)218-9217 or at nodogtoosmall5@gmail.com.